« Why is Hillary Clinton’s height still a mystery? Someone in Trump’s campaign just said that he accepts that Obama was, in fact, born in the US. That seems to have got a lot of media attention, but it is conveniently forgotten that it was Clinton’s supporters who started the whole Obama “birther movement” in 2008. The level of ridiculous rhetoric is now going to rise in the US and it will be difficult for Clinton to match Trump. Yesterday he proclaimed (again) to the electorate that she had started the Obama “birther” movement. We can expect much more from Trump and Clinton’s staff may be hard put to keep up. In battles of exaggerated rhetoric, tempo is of critical importance. The person who makes the first claim always has an advantage. It is having the white pieces in a chess game. But on the birther story, this certainly originated during the Clinton / Obama battle. There is still not much love lost between Clinton and Obama. The birther story was started, if not by Clinton, certainly by one or more of her supporters, and it was in 2008 during her primary battle with Obama. …. More than a full year before anyone would hear of Orly Taitz, the Birther strategy was first laid out in the Penn memo. The “othering” foundation was built subliminally by the Clinton campaign itself. Democrats and Clinton campaign surrogates did the dirtiest of the dirty work: openly spread the Birther lies. Staffers in Hillary’s actual campaign used email to spread the lies among other Democrats (this was a Democrat primary after all — so that is the only well you needed to poison a month before a primary). 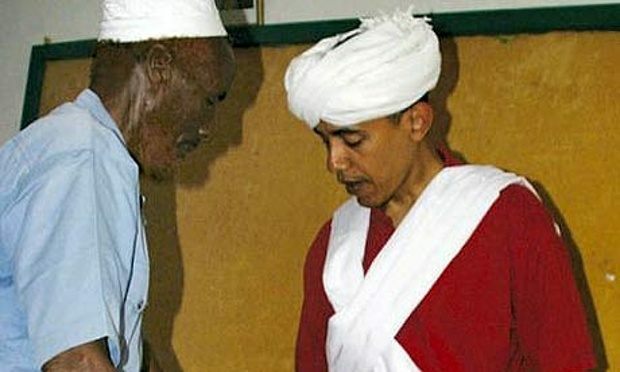 The campaign released the turban photo. Hillary herself used 60 Minutes to further stoke these lies. The article reblogged below was published by FactCheck in July 2015, just after Trump had announced his intention to run for President. Two Republican presidential candidates claim the so-called “birther” movement originated with the Hillary Clinton campaign in 2008. While it’s true that some of her ardent supporters pushed the theory, there is no evidence that Clinton or her campaign had anything to do with it. Neither Cruz nor Trump presented any evidence that Clinton or anyone on her campaign ever questioned Obama’s birthplace, demanded to see his birth certificate, or otherwise suggested that Obama was not a “natural born citizen” eligible to serve as president. For those unfamiliar with the controversy over Obama’s birthplace, it refers to those who contend that Obama was born in Kenya and ineligible to be president. At FactCheck.org, we have written about the issue of Obama’s birthplace on multiple occasions — indeed we were the first media organization to hold his birth certificate in our hot little hands and vouch for the authenticity of it. But facts have done little to squelch the conspiracy theories that continue to bounce around online. The issue arose again this week in an interview with Cruz, who was born in Canada to an American mother and a Cuban father. Yahoo News’ Katie Couric asked Cruz if he thought that was going to be an issue for voters. Politico, April 22, 2011: The answer lies in Democratic, not Republican politics, and in the bitter, exhausting spring of 2008. At the time, the Democratic presidential primary was slipping away from Hillary Clinton and some of her most passionate supporters grasped for something, anything that would deal a final reversal to Barack Obama. Claims about Obama’s birthplace appeared in chain emails bouncing around the Web, and one of the first lawsuits over Obama’s birth certificate was filed by Philip Berg, a former deputy Pennsylvania attorney general and a self-described “moderate to liberal” who supported Clinton. But none of those stories suggests any link between the Clinton campaign, let alone Clinton herself, and the advocacy of theories questioning Obama’s birth in Hawaii. Josh Schwerin, a spokesman for the Clinton campaign, said Cruz’s claim is false. “The Clinton campaign never suggested that President Obama was not born here,” Schwerin wrote to us in an email. It is certainly interesting, and perhaps historically and politically relevant, that “birther” advocacy may have originated with supporters of Hillary Clinton — especially since many view it as an exclusively right-wing movement. But whether those theories were advocated by Clinton and/or her campaign or simply by Clinton “supporters” is an important distinction. Candidates are expected to be held accountable for the actions of their campaigns. Neither Cruz nor Trump, whose campaign did not respond to our request for backup material, provides any compelling evidence that either Clinton or her campaign had anything to do with starting the so-called birther movement. This entry was posted on September 16, 2016 at 10:09 am and is filed under Behaviour, Politics, US. You can follow any responses to this entry through the RSS 2.0 feed. Both comments and pings are currently closed.